Well... THIS might be one of the most impressive* bathroom makeovers I've ever seen. While the original bathroom wasn't horrible, exactly, it certainly did not match the modern-meets-natural aesthetic of the homeowner. 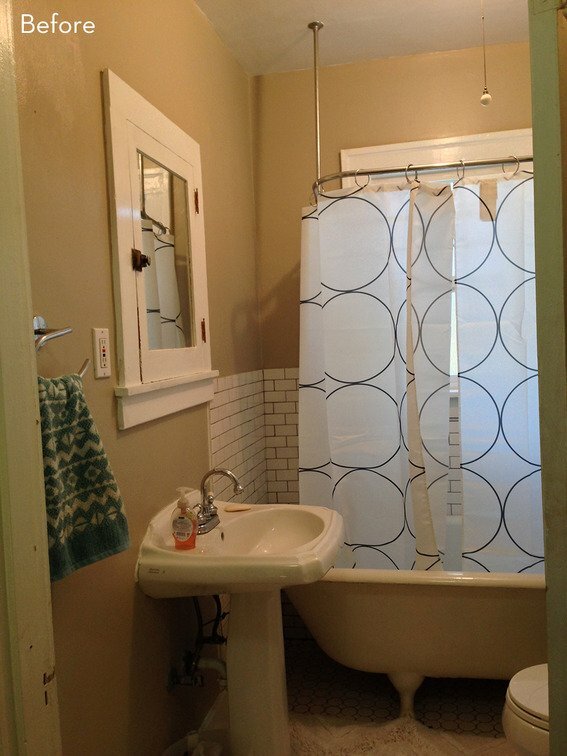 In one weekend, this small, half-bath got a major facelift -- and all for $150! This tiny bathroom needed to be re-done, and fast. It had dated fixtures and no personality. But that's not the case anymore - click through to see the massive transformation. It's not every day that I see a room makeover that *actually* makes my jaw drop. But when I spotted this renovation of an outdated, TILE ALL THE THINGS bathroom it happened -- along with an involuntary exclamation of some sort that can only be attributed to the wondrous powers that this makeover possesses. Guys... it's just so, so good. Pink walls, a two tone faucet and ancient hardware made this half bath feel like it was from a different decade. But after a few DIY projects and some elbow grease, this bathroom was transformed from dated to beautiful and beachy. With an outdated linoleum floor and fake tile wall panels, this bathroom was definitely in need of a refresh. So, of course, it got one! Okay, kids. This is it! My big, bold, dramatic bathroom makeover is finally ready to face the cameras (and the Internet). So, in the words of Samuel L. Jackson, "hold onto your butts" -- I'm about to drop some serious style up in this room. Last fall, with two little dogs in tow, my husband and I picked up and moved to Portland, Oregon to fulfill our lifelong dream of living in the Pacific Northwest. (Yes, we left our light and airy dream kitchen back in Utah -- I think about it often. RIP) We were quick to get our roots planted in our new city, though, and have started transforming our 1920s bungalow into a Scandinavian-inspired dream home, starting with a full-blown, down-to-the-studs bathroom makeover! This is one of the most drastic bathroom makeovers I've ever seen. The wallpaper was dated, the vanity was worn and grungy, and the green tile was just plain strange. Click through to see the unbelievable transformation.